If you read this website, you BETTER have apples in your fridge (or I'm gonna buy you some :) This is it people - apple season! But, how about DIY (do-it-yourself) apple CHIP? Yes, a crunchy apple chip to replace your greasy potato chip. It might not work as a replacement but it is worth a try. There are a couple tricks to make this recipe work. First of all, use a food processor to slice the apples thinly. It took me all of a minute to slice my apples. You don't have to peel them so there is no time issue there. But, you need to have 2 hours on your hands to bake these things. The idea is that the apples will become slowly dehydrated and crunchy. For those 2 hours, you aren't doing anything, of course, but you still need to be around. Also, you don't have to use sugar or cinnamon if you don't want to. I tried them without sugar and they tasted great. 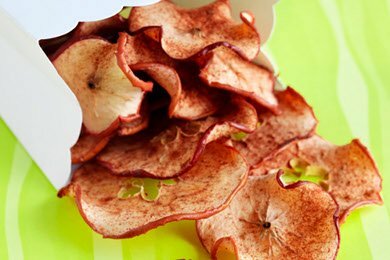 These are a really fun snack for kids to make because they can "help" you sprinkle the sugar and cinnamon on the apples. And, they will love having these in their lunch boxes. Think of the novelty - "Look, I made an apple chip!" Please share your apple snack ideas. 2. Thinly slice apples crosswise about 1/8-inch (2 mm) thick with a mandoline or sharp knife. 3. Arrange apple slices in a single layer on two parchment-lined rimmed baking sheets. In small bowl, combine sugar and cinnamon. Put mixture into a sieve and sprinkle evenly over apple slices. 4. Bake in the top and bottom third of the oven until apples are dry and crisp, about 2 hours. Remove from oven and let ‘chips’ cool completely before transferring to a sealed container for up to 3 days. Will definitely try this recipe! I've already linked it on my blog. Thanks! I've tried doing this before but they never get crisp. I love those apple chips you get in the store but they're fried and have stuff you don't want. I've done these in both a dehydrator and in a convection oven. Maybe it's the air flow that keeps them from crisping. I sliced on a mandoline so they were paper thin. They were a great snack, even if they didn't get crisp. Dried fruit is definitely a great healthy snack! We dry our own pears all of the time in the oven although at 170 degrees for about 12 hours or so but they turn out fantastic! We use them just as something to snack on during the day and also we put them into our lunch wraps (with La Tortilla low cal wraps, lettuce, tomato, broccoli slaw, peppers and cucumbers)! @J I don't know what to tell you - maybe it is the humidity of where you live? Mine got crisp after 2 hours at 200 - and they were really crunchy. Perhaps we could ask the people who came up with the recipe. quick question, 'cause I'm going to make these later when the kids get home from school. Did you core the apples or just slice them as is? My kids get a little wonky about the core & seeds. Perfect way to finish up the last of the apples we picked a few weeks ago! I've made apple chips before, and they're awesome! WOW!!! This looks so yummy I am going to have to try this. My Question to you is how did you fit in your cuisinard whole. Mine would not fit down the chute! @Mrs. Mix it - I didn't do it like the photo. I just cut up the apple into big chunks and pushed it down the chute. Mine were smaller than the photo. YUMMY! Can't wait to try this. My 2 year old just loves apples... This is another great on the go snack. I usually just use our apple slicer thing and put the slices in a bag on our way out, but they only stay decent for a certain amount of time, well depending on the weather, so this is a great alternative. Thanks! My apple chips are in the oven and the house smells divine. Had to alter the recipe a bit since I discovered I was out of parchment paper and I didn't add sugar. 1 1/2 hours to go! Well mine came out a bit chewy. Not sure why. But I'm willing to try it again with the parchment paper - maybe using a greased pan was the culprit. Plenty sweet enough using Macs and cinnamon, no extra sugar. The dehydrator works better for us with these apples. The oven is great but i can promise you that your kids will eat these up and quick! I mix pears in with the apples. Slice them thin, skin, seeds and all! They shrink up just enough that most of the seeds fall out and you are left with a great snack. Thanks for the tips! this looks like a great recipe that i really want to try out! Do you think I could use aluminum paper instead of parchment paper cuz were out of that now and I want to try this now!!! Hmmm...good question. I think you should be able to use foil. Here's a funny story - the last time I made dried pears I used wax paper instead of parchment paper (I was in a hurry and didn't realize that I used the wrong one) and it turned out to be a mess (my pears turned green)! :-( As long as you don't use wax paper you should be fine...I think. :-) Goodluck! I think these are a great idea even though I will not even touch a potato chip. Just three questions--is it alright to use aluminum foil or wax paper? I just do not have parchment lying around my house, but I should since I bake a lot. And, is it OK if I use a convection oven? My gas oven makes everything smell horrible, and the taste of gas is in my baked goods and I'm pretty sure it'll go into the apples too.